AIMS carries a variety of racking systems and is equipped to handle the installation. Pallet Racking is a system designed to store materials on pallets or skids in order to store palletized materials in horizontal rows with multiple levels. There are various forms of pallet racking, but all generally increase the efficiency of your warehouse or facility and increase the amount of storage space. Forklift Trucks are usually required to place pallets onto the racks for storage. Pallet racking is an essential element in manufacturing facilities, retails centres and warehouses. RackingDrive-in racking is a storage system which allows the highest density of storage. Forklifts are able to drive into the series of stacked tunnels and pull out the pallet of their choice. This type of system is recommended for storage units which have fast moving product and are frequently pushing pallets in and out. Drive-in racking is a less expensive solution, but is more prone to damage from forklifts constantly moving product in and out. Cantilever racking is used to store and organize long flat items and any associated weight with these items. They are often used to stack lumber, pipes and other long materials and allow a much easier method to load and to unload these particular items. A basic cantilever racking system would consist of two vertical columns with horizontal load bearing arms bolted at various levels. Extra Heavy Duty is designed for extremely heavy loads for which a standard pallet racking system will not suffice. Systems can be designed with capacities of up to 50,000 lbs per level still maintaining its 3" vertical adjustability and uprights can be designed to carry up to 250,000 lbs. Mezzanines are an ideal storage solution to maximize plant cube space. The long span freestanding post and truss structural mezzanines (raised storage platforms) best utilize additional storage, office and/or work space, gaining even more valuable floor space. They’re custom designed and built to meet your specific needs and requirements. We can be made available for site visits to assess your storage space and determine the best solution for your space. 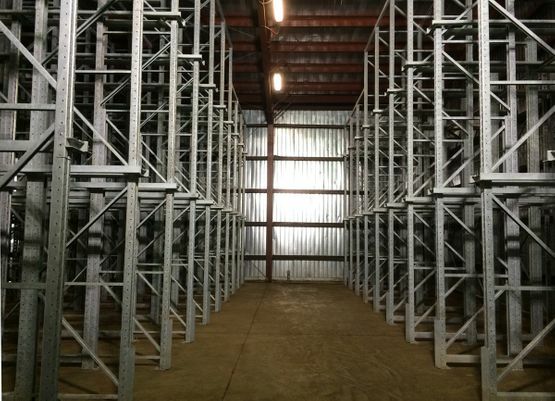 We also offer installation and safety inspections of all of our racking systems. Contact our team for more information regarding our racking system solutions.